Well, I went on the trip…. and I couldn’t operate a single bit. The noise floor in the hotel was S9+… on ALL HF bands. It appeared to be the AC units in the building. While I have experience helping a friend troubleshoot AC units (“A Tale of Two Air Conditioners”, August 2016 Edition of QST – HERE is one copy that is online as of publication of this post), there was no way I could possibly fix ALL of them. When I got home, i decided to test the system out… what better time to try out this new FT8 mode, since I already had the software installed. For the record, the first dozen times i heard about FT8, i thought it was a new Yaesu radio… but I digress. I connected everything, and tossed a wire over the kitchen soffit. 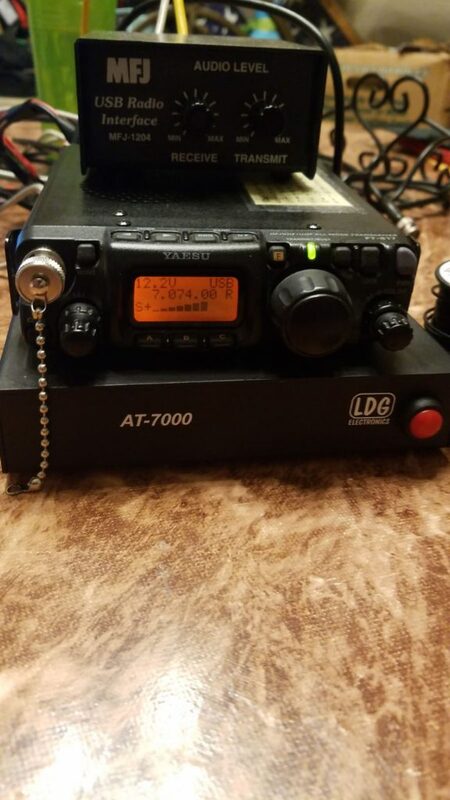 I tuned to 7.074 MHz, and I heard a bunch of noise – a good start. Firing up WSJT, i saw a bunch of stations, and after some experimenting, I found that the radio had to be in USB mode to decode anything. Next, i tried to transmit… but I got no power output (no indications on the front panel), yet the red TX indicator was lighting up. This was perplexing… did I need to troubleshoot the system? I was careful building the cable… and I haven’t messed it up by going to Mod Ver 2.0 (see the last post) yet. After some digging around on the web, it would appear that the FT817 doesn’t activate the rear port until you change modes to DIG or PKT – leaving USB and LSB only active with the microphone! The other posts I found weren’t completely clear on this, but when I fired up FLDIGI and hit the “TUNE” button in the software, I IMMEDIATELY saw power output indicated on the front panel (well, along with the HI SWR indicator, as I didn’t have an antenna connected… oops!). 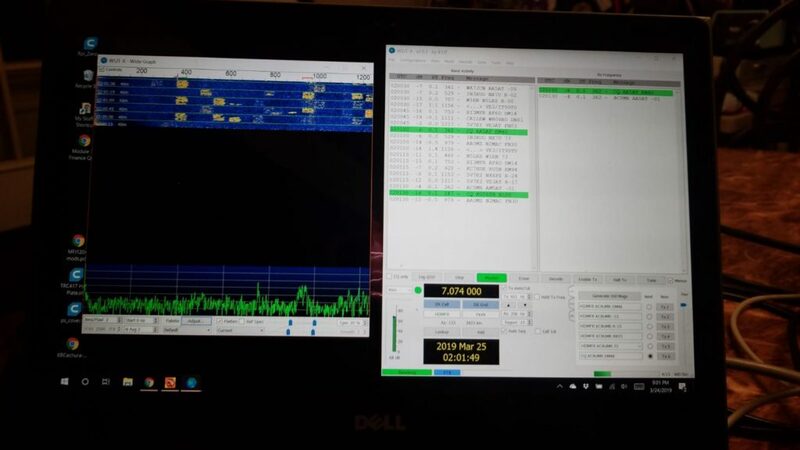 So – a word of advice for FT817 owners – if you are planning on using the ACC / DATA ports for digital modes, the DIG and PKT modes DO have a purpose – unlike other radios, those connections on the back are only active for transmit audio when those modes are selected. Strangely, i would normally expect that the PTT would be disabled from these connectors when those modes aren’t selected, but that is not the case. Next… to actually put it on the air….